High energy footwork and jungle infused bass music! LAZERCRUNK is a club night that was founded in 2008 on the principle of bringing the best in fun, new, anything-goes bass music with touring and local guest performers, fun themes, live lazers and other wackyness in the club. For 2017, we’ve decided to break out of the mold of the past several years, and alter our format to mix things up and bring some fresh energy. Going forward we’ll be having four quarterly nights at our original home base, BRILLOBOX (Mar, June, Sept, Dec) and four quarteryly nights at the original ultra-dive, BELVEDERES (Feb, May, Aug, Nov). We’re also re-dedicated to bringing in unique visuals and themes that you won’t see at any other regular event, as well as keeping pushing things forward with top quality guests, both touring and local. Beyond that, we’ll never take ourselves too seriously – LAZERCRUNK is all about letting loose and having fun. 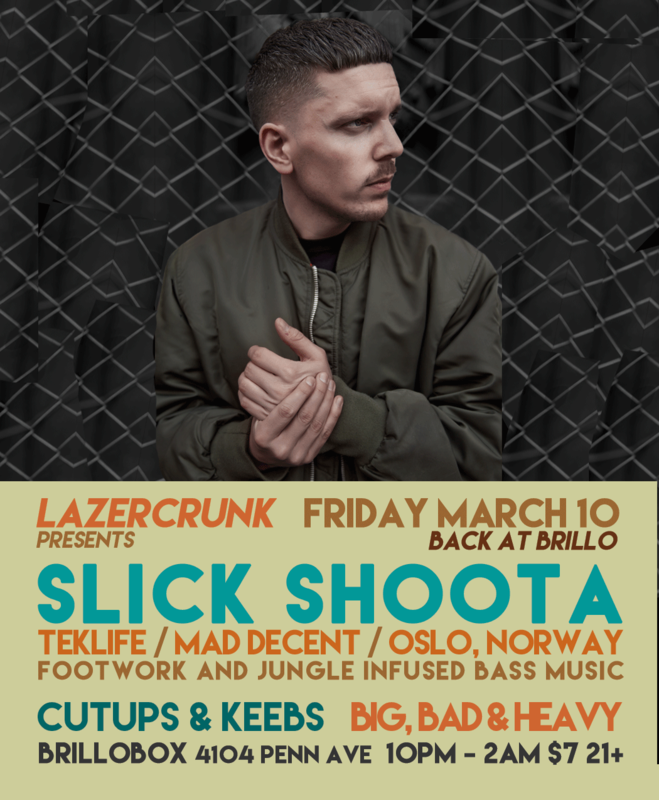 Slick Shoota is an Oslo-based producer known for producing high energy club hybrids. His productions take inspiration from a myriad of sources, among them Chicago’s footwork and the UK’s jungle and a host of other types of club music. With his productions he has carved out a unique sound that bridges both historical and geographical gaps, a sound that is well defined and exploratory at the same time. Together with Skawr and Drippin he runs acclaimed club night and label Ball ‘Em Up, which has seen success in Norway, hosting performers like Sinjin Hawke and Zora Jones, Visionist, Jam City and Yung Lean. This eclectisism in the club night’s guests is also reflected in Slick’s performances, digging for tracks on the internet for hours on end to keep his sets unpredictable and entertaining. Slick has received support from several notable producers and dj’s, like Scratcha DVA, Machinedrum, Oneman, B. Traits, Monki, DJ Spinn & DJ Rashad and the whole Teklife Crew. In November 2015 it was announced that Slick Shoota would join the legendary Teklife crew as an official member. Slick Shoota has released music across top labels in the bass music scene, and been lauded as one of FACT Magazines favourite remixers and received a glowing review of the Mad Decent released single ‘F Dat’ on Pitchfork. In summer 2015, Slick Shoota joined Noisey for an installment in their ’48 Hour Mixtape’ documentary series. For two days he was joined by a camera crew, documenting his collaborations and productions with other producers and artists in Oslo. The resulting EP features collaborations with Drippin, Boska, Purpurr Purple and Samsaya.